Doing anything Harrison Ford has done is bound to make you nervous. Even brushing your teeth after you realize that Harrison Ford has been practicing dental hygiene for decades will deflate your ego a little. So you can imagine how nerve-wracking it is to try playing Han Solo after him. 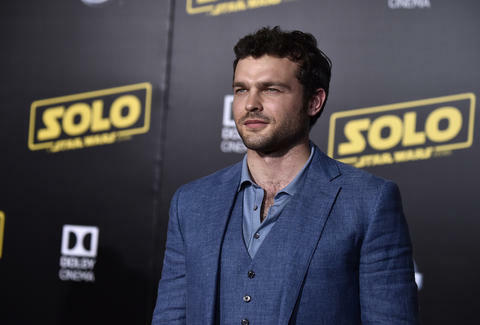 The 28-year-old Alden Ehrenreich is currently attempting this as he's starring as a young Han Solo in a Solo: A Star Wars Story. And Harrison Ford himself crashing a press interview probably didn't make him any less nervous. As you can see in the clip, Ford entered the room behind the young Solo as Ehrenreich was sharing details about a previous conversation with Ford. Apparently, the OG Han Solo told him, "If anyone asked, I told you everything you need to know and you’re not allowed to say a word." As Ford came into view, Ehrenreich expressed his disbelief and Ford shouted, “Get out of my chair! Get out of my life!” in that curmudgeonly way that's become his specialty. Then they shook hands and all of our hearts melted. Later at a press conference, Ehrenreich gave some background on the meeting: "He was so effusive about the movie and it meant so much to me and I know for Ron [Howard] and [Kathleen Kennedy] and everybody. It’s just such a huge deal to have him really genuinely love it. He really genuinely enjoyed the film and it meant a lot to me that he took the time to come out here and do that." So, as terrifying as it must be to follow Harrison Ford, it must be a little comforting to know he's being supportive.